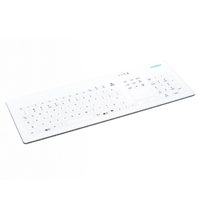 The Cleankeys CK4 Wireless Capacitive Desktop Glass Keyboard from Indukeys is a wipeable, waterproof wireless keyboard designed for environments in which hygienic conditions are a necessity, such as medical and dental operatories. The surface of this touch-sensitive (i.e. zero force) keyboard is a completely flat Gorilla Glass 3 that is easily cleaned using hospital-grade disinfectants. Keystrokes are activated by lightly touching the legended key areas on the surface as there are no moving mechanical parts in the keyboard. The keys have adjustable sensitivity and volume to provide some confirmation of input in the absence of tactile or haptic feedback. A touchpad area for mouse input (including two dedicated areas for left and right click) occupy the traditional location of the cursor keys. The directional cursor keys are still available and have been relocated below the Enter and Right Shift key area. The ISO compliant standard 103 key layout makes transitioning to a different keying action easier for users. The one-touch "Key Lock" feature locks out all key input to avoid accidental data entry, and is especially valuable when cleaning is required. This function is activated and de-activated by a simple 2-second touch on the "Key Lock" indicator. For applications where wireless is not a necessity these same features are available in a Wired model. The Indukey InduProof Basic Silicone Keyboard features a closed silicone surface which completely protects the device from liquids and dust with an IP68 protection level. This makes these washable and disinfectable keyboards ideally suited for environments with high hygienic requirements. The robust construction ensures a long service life, and an embedded mousebutton (cursorpoint-style) pointing device with left and right mouse click button and provides a complete all-in-one solution. The keyboard is 387 mm x 146 mm x 27 mm and weighs 1350 grams. This keyboard uses a higher durability short travel mechanical element keyswitches (0.3 mm travel) with 265 grams (2.6 N) operating force rated at 3 million operations. The layout features 105 keys and does include a numeric keypad. 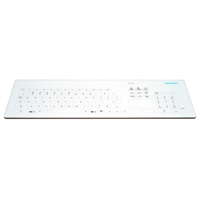 The Cleankeys CK4 Capacitive Desktop Glass Keyboard from InduKey is a wipeable, waterproof wired keyboard designed for environments in which hygienic conditions are a necessity, such as medical and dental operatories. The surface of this touch-sensitive (i.e. zero force) keyboard is a completely flat Gorilla Glass that is easily cleaned using hospital-grade disinfectants. Keystrokes are activated by lightly touching the legended key areas on the surface as there are no moving mechanical parts in the keyboard. The keys have adjustable sensitivity and volume to provide some confirmation of input in the absence of tactile or haptic feedback. A touchpad area for mouse input (including two dedicated areas for left and right click) occupy the traditional location of the cursor keys. The cursor keys are still available; they have been relocated under the Enter and Right Shift key area. The integrated KEY LOCK function protects from accidental input by locking out key input during cleaning. Note:This keyboard DOES NOT include the Print Screen, Scroll Lock, or Pause/Break keys. If you need these keys you should consider the Wireless version of this keyboard. The Indukey InduProof Advanced Silicone Keyboard features a closed silicone surface which completely protects the device from liquids and dust with an IP68 protection level and a UW-1 underwaterproof rating. This makes these washable and disinfectable keyboards ideally suited for environments with high hygienic requirements. The robust construction ensures a long service life, and models of this keyboard with an embedded pointing device provide an all-in-one complete solution. The keyboard is 340 mm x 165 mm x 16.3 mm and weighs 800 grams and features VESA 75 boreholes on the underside allowing this keyboard to be easily mounted for a variety of applications. The On/Off switch allows this keyboard to disengage from the computer for a complete cleaning with the computer system still running. This keyboards uses carbon contact pill keyswitches (1.0 mm travel) with 204 grams (2.0 N) operating force rated at 2 million operations, providing a crisp tactile feedback and very low noise level. The mousing device is available in either a mousebutton (cursorpoint) device or touchpad with left and right click button. The Indukey InduProof2 Silicone Keyboard features a closed silicone surface which completely protects the device from liquids and dust with an IP68 protection level. This makes these washable and disinfectable keyboards ideally suited for environments with high hygienic requirements. The robust construction ensures a long service life. The keyboard is 387 mm x 150 mm x 22 mm and weighs 1200 grams. The Indukey InduProof3 Silicone Keyboard features a closed silicone surface which completely protects the device from liquids and dust with an IP68 protection level. This makes these washable and disinfectable keyboards ideally suited for environments with high hygienic requirements. The robust construction ensures a long service life, and an embedded mousebutton (cursorpoint-style) pointing device with left and right mouse click button and provides a complete all-in-one solution. The keyboard is 320 mm x 145 mm x 22 mm and weighs 1000 grams. This keyboard uses a gold plated slightly curved metal dome style of keyswitch (0.6 mm travel) with 306 grams (3.0 N) operating force rated at 2 million operations which makes contact with the underlying PCB when being actuated. The layout features 86 keys and does not include a numeric keypad. This keyboard also comes in a model which is backlit in eight stages to facilitate deployment and usage in low light environments. The Indukey InduProofMed Silicone Keyboard offers all the features of the regular InduProof keyboards with the addition of a coating antimicrobial agent which inhibits the growth of germs. The closed silicone surface completely protects the device from liquids and dust with an IP68 protection level and a UW-1 underwaterproof rating. This makes these robust washable and disinfectable keyboards ideally suited for environments with high hygienic requirements which require a long service life. The keyboard is 385 mm x 160 mm x 21 mm and weighs 1300 grams. This keyboards uses carbon contact pill keyswitches (1.0 mm travel) with 204 grams (2.0 N) operating force rated at 2 million operations, providing a crisp tactile feedback and very low noise level. The InduMouse features a closed silicone surface which completely protects the device from liquids and dust with an IP68 protection level. 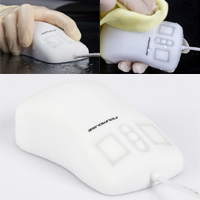 This makes these washable and disinfectable mice ideally suited for environments with high hygienic requirements. The robust construction ensures a long service life. The ambidextrous convex design and low weight provides a comfortable, functional mouse. The integrated scroll function utilizing 3 small buttons, with 153 grams (1.5 N) operating force, provides a feature not normally found on mice of this kind. The mouse is 116 mm x 62 mm x 38.6 mm and weighs 160 grams. 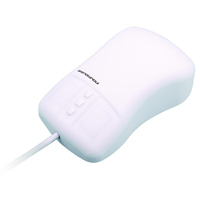 The InduMouse Smart Clinical Mouse by Indukey provides a familiar, conventional designed mouse in an easy-to-clean hygienic package which meets IP68 standards. It is a corded 1000 DPI laser mouse with 3 buttons and 2 scroll buttons instead of a scroll wheel. The buttons are short travel mechanical keys rated at 3 million operations, with a 0.3 mm travel distance and a 1.5N force. The surface of the mouse is silicon with a plastic bottom panel. It weighs 160 grams, comes with a standard 2 meter cable, and is the same size as most conventional mice (116 mm L x 62 mm W x 39 mm H). The mouse has a clean white appearance and requires a USB interface. The Smart Clinical Financial Compact Keyboard by Indukey features a closed silicone surface which completely protects the device from liquids and dust with an IP68 protection level. This makes these washable and disinfectable keyboards ideally suited for environments with high hygienic requirements. The keyboard is 370.5 mm x 150 mm x 11 mm and weighs 760 grams. This keyboard uses carbon contact technology keyswitches (1.0 mm travel) with 153 grams (1.5 N) operating force rated at 2 million operations. There are four individual contact points in each of the four corners of the keyswitch to ensure that the key will generate a keystroke regardless of where the user presses on the top of the keycap. The layout features 106 keys and includes a numeric keypad.